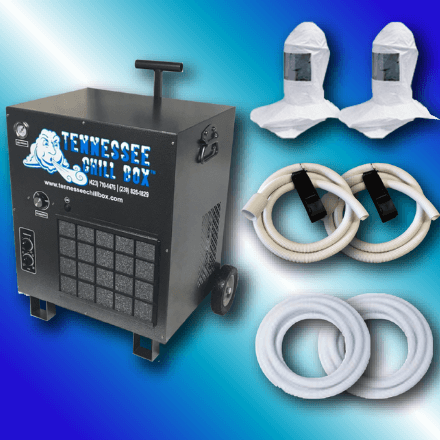 High CFM Respiratory System solution – for use with hoods, masks, or ratchet respiratory shield, complete with handle and wheels for system mobility, (2) 100 ft air line hoses, 2 hoods, breathing tubes, belt and clip, dual adapter for 2 man use, and all fittings and connections for easy connect/disconnect. The Chill Box 8000 offers 40% more cooling capacity than the original CB 5000. Up to two (2) hoses may be used, and up to 200′ each with our standard kits. Tennessee Chill Box supplied Air Hoses & Breathing Tubes MUST be used in conjunction with the CB8000.